Info "I never forget a pepper. You?" 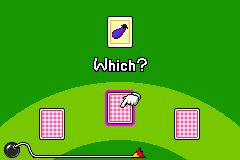 Produce Pick is one of Orbulon's microgames in WarioWare: Twisted! When the game starts, a group of cards will be shown. After a short while, they will be flipped and a card will be shown at the top. The player's job is to find its equivalent in the group of the flipped cards. If the chosen card matches the one at the top, the game is won. 1st level difficulty: Two cards to choose from. 2nd level difficulty: Three cards to choose from. 3rd level difficulty: Four cards to choose from.